Gingerbread, a flavour close to my heart. If you look up at the top of the page you will see a section titled Gingerbread Houses, after you’re done here jump over and take a look! There you will find the collection of my gingerbread builds that have raised $1000’s of dollars for charity. Thanks for checking them out, I cherish the fact that with sugar and flour I can make such substantial donations during the Christmas season. 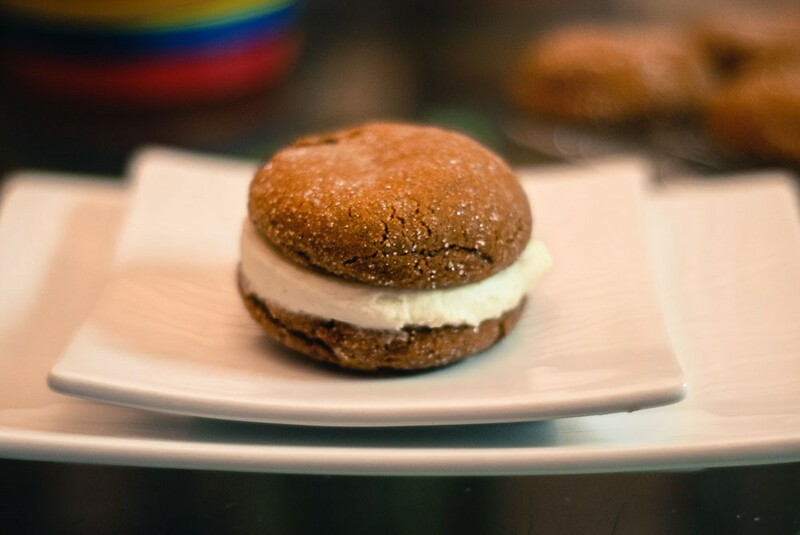 Now about these Gingerbread Whoopie Pies. They looks amazing yes?! I thought so too. I was inspired from all the Whoopie Pies showing up in my Instagram stream a couple of weeks ago from some of the amazing Canadian food bloggers I follow. They were served during a coffee break on the final day of #FBC2016 in Toronto. Due to business obligations I could not attend the conference this year but eagerly watched my social media feeds to capture as much of the action as I could. For days after the conference I was distracted by thoughts of those whoopee pies and knew I had to recreate them at home. They turned out amazing! Soft and tender, full of traditional gingerbread flavour and a creamy buttery filling, perfection really! I invite you to give them a try and let me know what you think! Perfect for holiday cookie trays, the quintessential side to a steamy hot cup of coffee or a mug tea, definitely a must try! As always, thanks for stopping by. Have a fantastic rest of your day! Mix all the dry ingredients except the ¼ cup of granulated sugar together in a bowl. Beat butter and brown sugar in large bowl with electric mixer on medium speed until light and fluffy. Add molasses, egg and vanilla; beat well. Roll into 1 inch balls and place on a plate. Roll the cookie balls in the granulated sugar and place on a silpat or parchment lined cookie sheet. Let cool on the cookie sheet for 5 minutes. While they are cooling make the buttercream icing. Cream the butter in the bowl of a mixer. Add half the confectioners sugar, 1 tablespoon of milk and the salt. Add the remaining confectioners sugar, milk and vanilla. If the icing appears dry add an additional table spoon of milk. Spread a generous amount of icing on one cookie and top it with a second creating a sandwich. I got to taste the whoopie pies at the conference and they were the ultimate treat! Think these cookies (or cakes?!) would make for a great holiday treat. They look beautiful! And it’s so impressive that you’ve been able to make such a significant contribution with your beautiful gingerbread builds. Thank goodness for Instagram, but it’s a bummer you couldn’t make it to FBC2016. 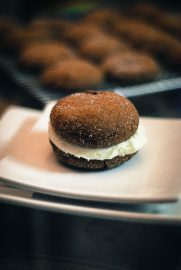 The whoopie pies at the coffee break were delicious, but gingerbread flavour is always a win for my tastebuds! I can’t wait to make these in my own kitchen – thanks for sharing your own recipe! And I love that your beautiful gingerbread houses raise money for charity! Such a unique way to give back during the holidays. So sorry to have missed the conference. At the speed of which #FBC2017 tickets are selling I fear I may miss next year as well. I have been investing my spare $$$ into my photography studio. I love the new look of the site as well and plan to reshoot some of the images that were taken with my iPhone when I was working full time. I love my phone images but they do not always showcase the images as well as my big camera can. I hope you enjoy the Whoopie Pies! This is the first time I’ve had a Whoopie Pie. I think they are pretty good but one goes a long way as I am more of a savoury snacker then sweet. I know your wife will enjoy them. I knew the moment I seen them they had to happen in my kitchen! Mine are a bit darker then the ones that filled my IG feed but they taste just as amazing! These look delicious! I did enjoy one at the conference, and now I can do so again in the privacy of my own home (where I’ll probably enjoy more than one, lol). Love the new look of your blog! This format really showcases your (amazing) photography. While I’m not a huge fan of whoopee pies or gingerbread ( the horror!) But my wife loves both. I also saw these in some Instagram pictures during FBC convention week and I must say they do look good! Those look amazing- I am pinning them to my “Gingerbread – things to make and bake” on Pinterest!